Perhaps no eating place is as close to the hearts of long- time South Floridians as the string of Royal Castles. Dozens of them throughout South Florida dished out 15-cent hamburgers, nickel birch beers, and a pretty good breakfast of eggs, bacon, and toast. 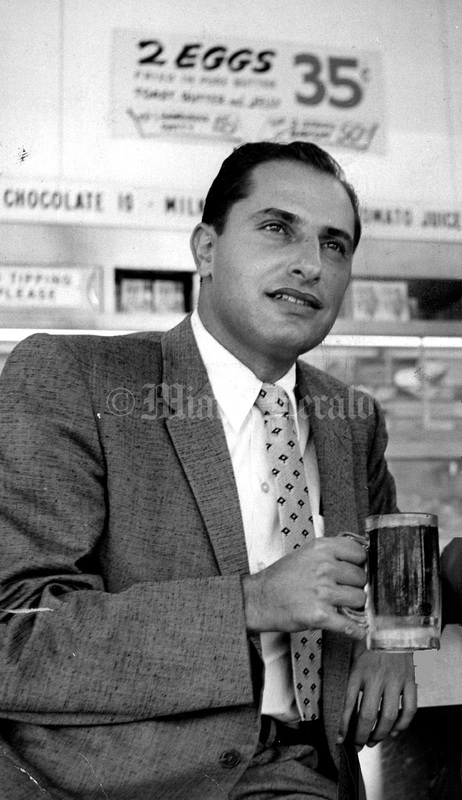 The restaurant grew from a single hamburger stand opened by William Singer on March 18, 1938. He opened the stand at 7952 NE Second Ave. after failing in the beer business. The low prices and limited menu — basically small, five- cent hamburgers and chili for lunch, fresh eggs and cereal for breakfast, were the foundation for over 30 years of growth. Most of that growth was in the 1950s and ’60s. 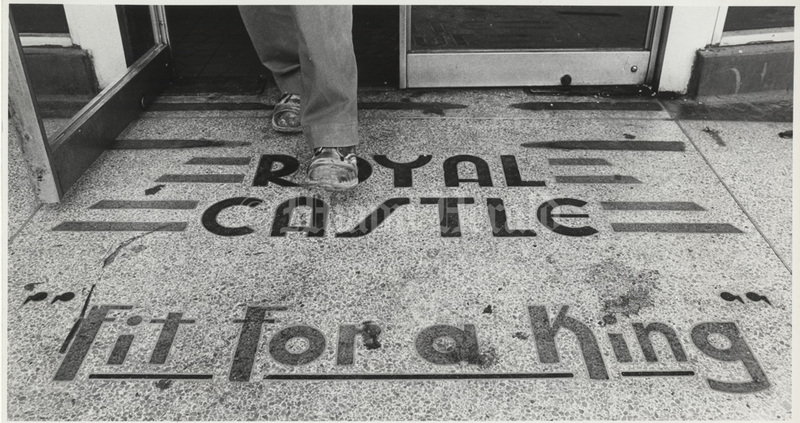 In 1951 there were 19 Royal Castles. By 1962 there were 100, on the way to the late ’60s high of over 170. The corporation was as conservative in its dealings with minorities and women as it was about changing the menu. As late as 1961, African-Americans were staging sit-ins to gain counter service. They had been limited to using outdoor take-out windows. Women were not allowed to work behind the counter until 1967. Over most of its history, the business was private, family owned. It went public in 1965. By 1969, the chain reported sales of $221 million from restaurants throughout the south. But while revenues were rising, profits fell. 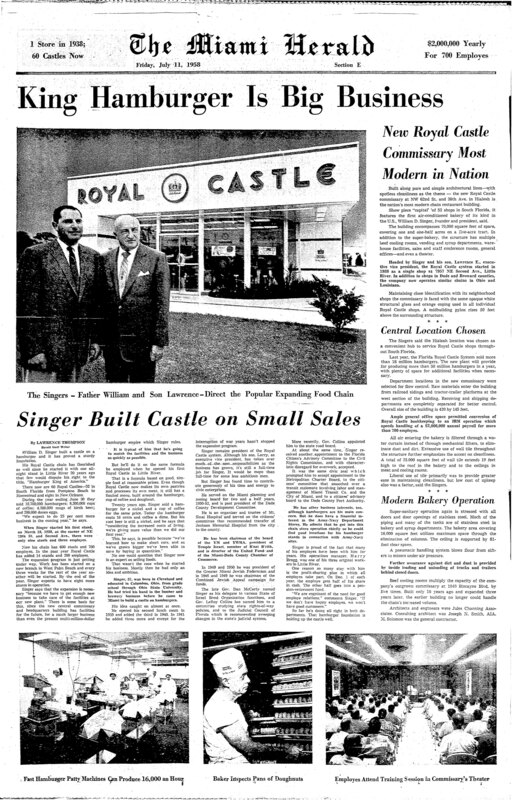 William Singer sold his interest in the company for about $6 million in the late 1960s. His son, Lawrence, ran the show for several years, branching out in unsuccessful efforts to franchise the name and opening higher priced restaurants. None of these was able to pull the chain back into the black. After Lawrence stepped down, former Florida Governor LeRoy Collins ran the company for about a year. In 1975, the company folded, by then owned by the same corporation that failed with Minnie Pearl Fried Chicken stands. OPEN. The last Royal Castle is located in Northwest 79the street and Unity Boulevard. 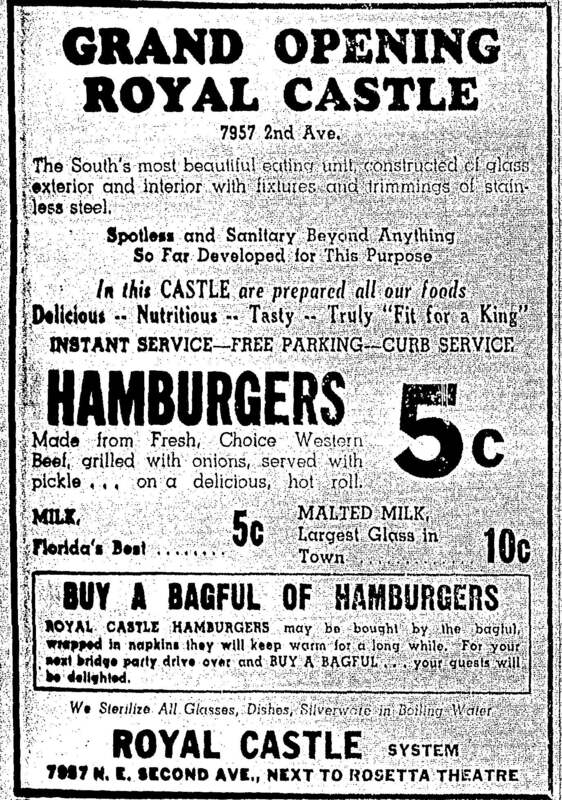 Undated, Alan Freund/Miami Herald: Royal Castle on 16700 NW 27th Ave.
5/17/1957: Lawrence Singer, founder William Singer’s son. Under Lawrence Singer, the chain blossomed to at least 185 stores concentrated in Miami-Dade County, with a few in Georgia and Louisiana.